Love this trend, there is an AMAZING iridescent neoprene Cynthia Rowley dress that I’m drooling over! Bag #2 is amazing, love this trend actually. This will always remind me of The Little Mermaid, and I love it. 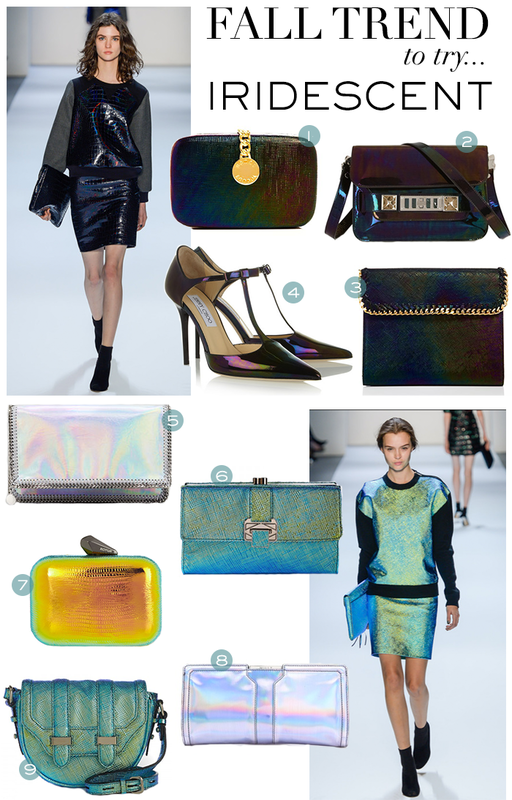 While I am not a fan of anything iridescent, I do like the Milly clutch and Jimmy Choo shoes. Wow–this trend makes such a statement. I love the new take on traditional fall colors! These are so fun! Especially love the chain detail on the Henri Bendel clutch! love the stella clutch…i think a shiny accessory is the way to go for this trend!